The crowd gathers to City of Refuge in LA for the ‘Revival Starts with Me’ rally. 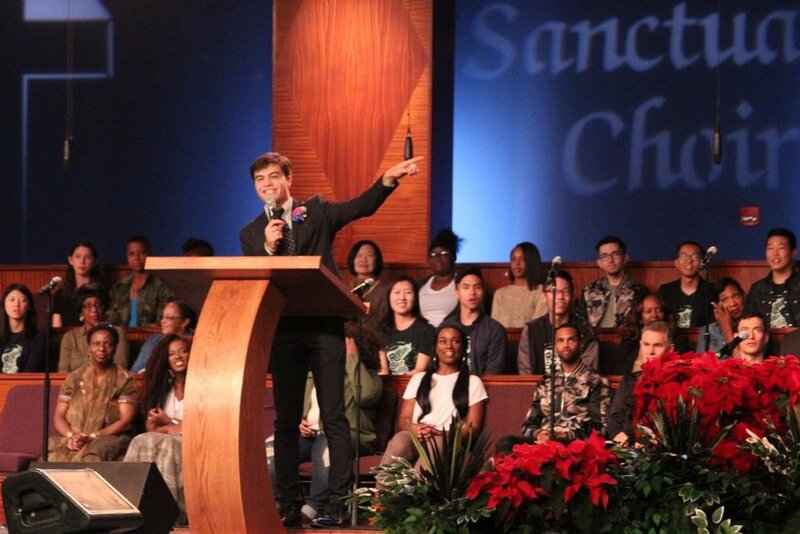 On December 16th, CARP Los Angeles (LA), in collaboration with the American Clergy Leadership Conference (ACLC), hosted a Revival Starts with Me Rally for the peaceful reunification of North and South Korea. This rally was inspired by Dr. Hak Ja Han Moon’s successful rallies in Thailand, Japan, United States, and Korea this year. The issue of North and South Korean peace is a hot topic in the world today, but to CARP’s founders, Father and Mother Moon, this issue is a personal one. As refugees from North Korea, they saw first-hand the effects of how a divided country hurts its people and how a communist ideology ruins lives. They also realized that peace on the Korean peninsula could lead to world peace. 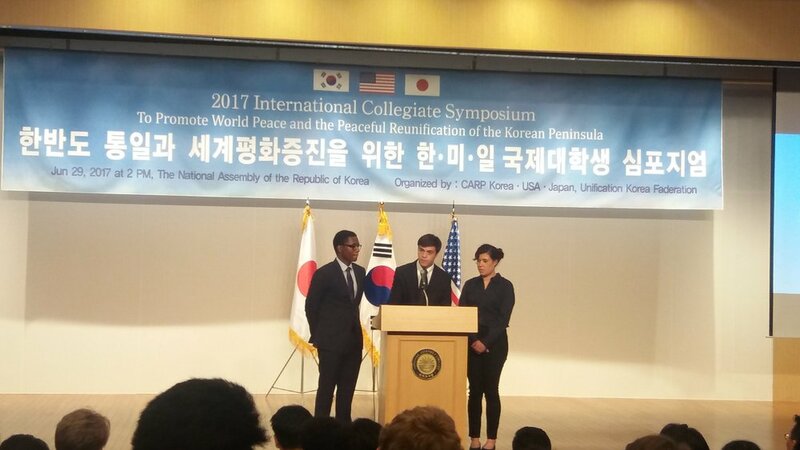 (Left to Right) Jermaine Bishop Jr., Joshua Holmes, and Naomi Froehlich of CARP America speak at the South Korean Congress Building. CARP LA was inspired by Father and Mother Moon’s vision during their international exchange trip to South Korea earlier this year in July. During that trip, three American student representatives had the opportunity to speak about the peaceful reunification at the South Korean Congress building. Following that, CARP LA decided to host one rally at the end of this year and two more next year. “[This rally] was something that we could do to support Mother Moon’s efforts for global peace as well as a way for each of us to take responsibility over the situation that the world is facing today. Considering all of the recent tragedies that have taken place all across the globe, we really felt connected to this vision of bringing people together as a common humanity and one global family under God. 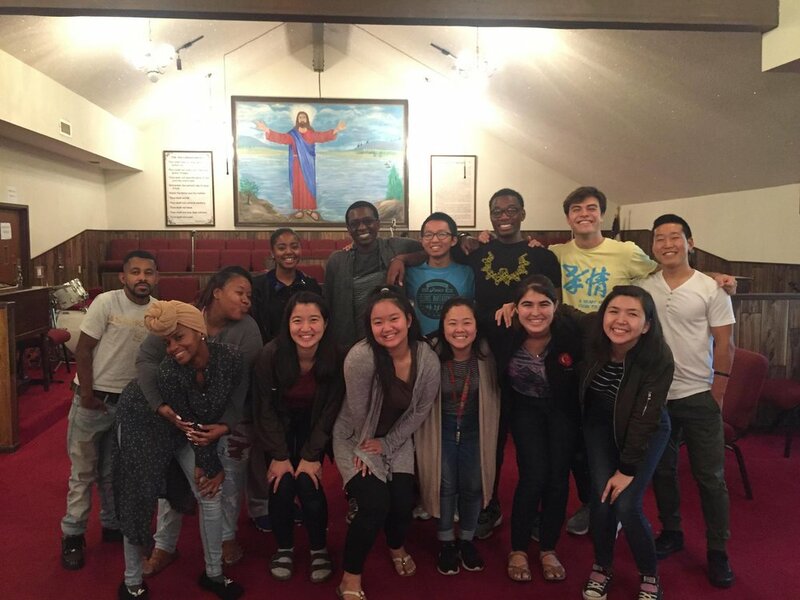 CARP LA visits Rock of Faith Church for Bible Study! The organizing group for the rally connected to Christian churches with the understanding that true love and peace comes from God, our Creator. Knowing that God is our Heavenly Parent gives us a basis to treat other humans like brothers and sisters. Based on this understanding, the organizing group connected to many pastors and congregations and invited them to the rally and participate in the joint choir. 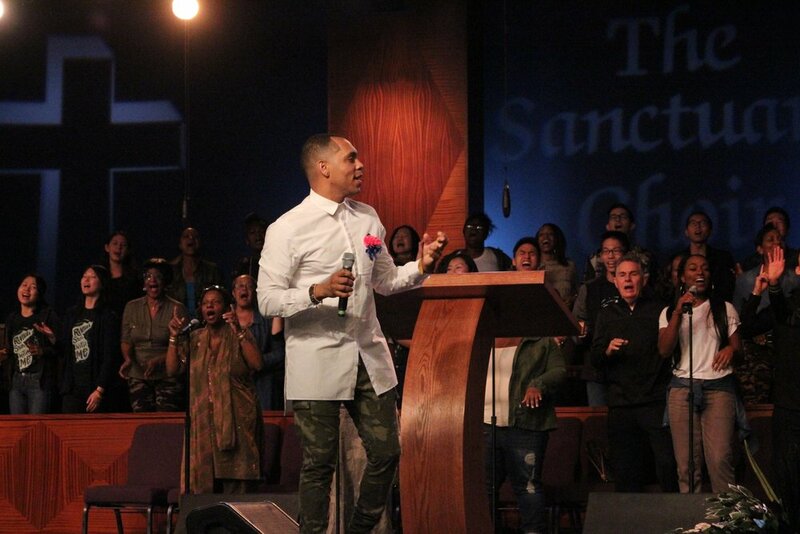 The City of Refuge, the host of the event, was inspired to let us use their venue because of our youthful spirit. Bishop Noel Jones, the Senior Pastor at the City of Refuge, went to South Korea just last month to attend Mother Moon’s 80,000 person rally for Korean peace and was even more inspired to support this initiative. CARP ECC shares about the rally on campus. Every week since October, CARP members made preparations inviting others to come from churches and college campuses. Jason McGee directs the choir on December 16th. 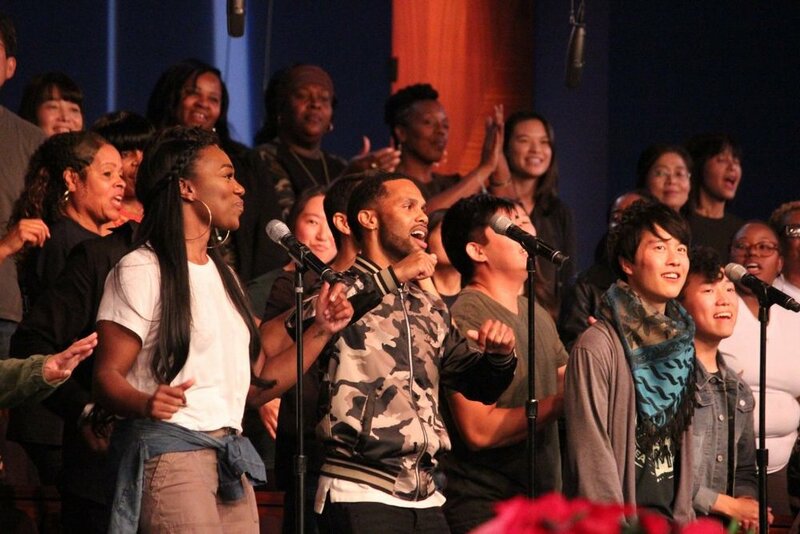 The choir members consisted of 20 different church choirs and CARP members. Joshua Holmes, Master of Ceremonies, takes the stage. Joshua Holmes, the Master of Ceremonies for the event and CARP Cypress President, guided everyone through the program with spirit and vigor. He was full of energy and shared it freely with the participants. Dr. Ki Hoon Kim, FFWPU International Vice President, gives some opening remarks. Family Federation for World Peace and Unification (FFWPU) International Vice President, Dr. Ki Hoon Kim, offered a greeting and shared about the personal impact that the divided Korea has had on his life and family. Because of the division, he has been separated from and unable to meet his grandparents who were isolated in North Korea. His testimony touched everyone in the room and helped connect the issue to a very personal and family level. Jermaine Bishop gives his speech with passion and fervor. Rev Sun Myung Moon [and Dr. Hak Ja Han Moon] saw the [problem] right here in America. They saw people living in abundance and prosperity who stored it all up for themselves instead trying to figure out what can we could do to be a blessing to one another. There is nothing politics can do to help us overcome that misunderstanding. We live in a country where the things we do influences artists, engineers, politicians, and entrepreneurs that influence every corner the world. At the end of his speech, Jermaine led the entire rally in a prayer for the peaceful reunification of North and South Korea. The participants offer a unison prayer for the peaceful reunification of North and South Korea. The keynote address was given by City of Refuge’s Bishop Noel Jones. He shared that God’s intention was for all of us to share love with each other. God created us with equal value, and therefore we should love each other equally. 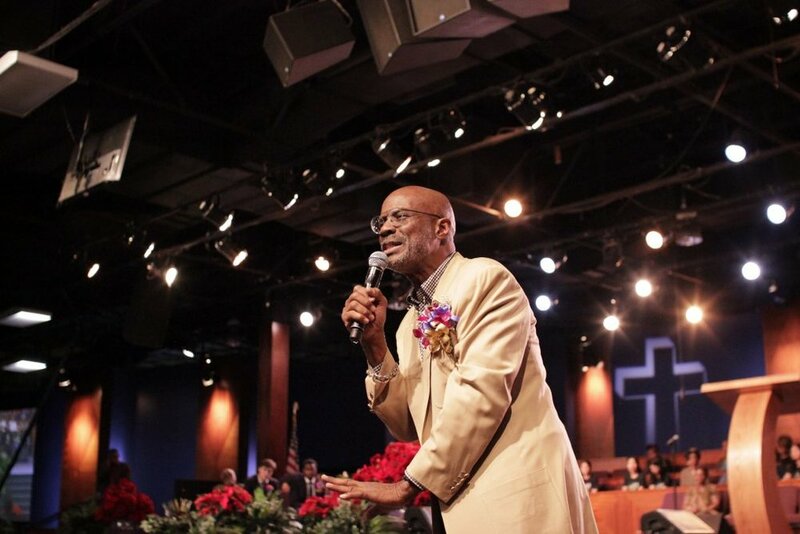 Bishop Noel Jones gives his keynote address. Bishop Jones captivates the crowd. He also shared how he was inspired by Mother Moon in Korea at her rally in November. He said he was inspired by her because she was a ‘giver’; he said givers never decrease because God always gives to those who give to others. It is with that kind of heart, a heart of giving and loving, that will end the suffering in North Korea and bring peace to the peninsula. The program ended with about 50 members of CARP, including members from Bay Area CARP, Las Vegas CARP, and Dallas CARP, performing Mujogeon, the dance created for Mother Moon’s Madison Square Garden Rally in New York in July of this year. Power and passion of youth brings this dance to life. The song, which translates to ‘unconditional’ in Korean, represents the spirit of a young person who unconditionally follows wherever God leads. Full of energy and excitement, many who attended the rally said seeing the bright young people dance with this purpose was the highlight and perfect culmination of the event. Emily Iseda of CARP UCLA reps the rally T-shirt. Around 1,200 people showed up to the rally. After months of preparation, the students could finally see the fruits of all of their investment. Different faith leaders came in support of the event. The real impact of this rally wasn’t so much what was said but what was done. People from all walks of life – from college campuses, 20 different churches, and local community members – were gathered to talk about this global issue and how to bring peace and understanding. Participation in this effort together helped us see how we need to take care of each other, whether the person across the street or across an ocean. We learned that it’s not science or politics that brings people together; it’s love.